If you don't have a cast-iron skillet, use a 9-inch square baking pan; cool bread in pan on a rack for 10 minutes, then invert and cool 10 minutes more before serving. Preheat oven to 425 degrees. 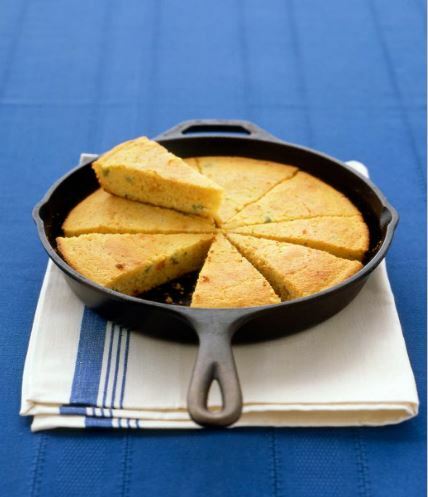 Put butter in a 9-inch cast-iron skillet; place in oven until butter is melted and pan is heated through, 3 to 5 minutes. Meanwhile, in a medium bowl, whisk cornmeal, sugar, baking soda, and salt; set aside. In a large bowl, whisk together eggs and buttermilk. Carefully remove hot skillet from oven; immediately pour butter into the buttermilk mixture, and whisk to combine. Using a pastry brush, coat bottom and sides of pan with remaining butter. Stir cornmeal mixture into buttermilk mixture until just moistened. Stir in jalapeno. Scrape batter into hot skillet; bake until golden, about 25 minutes. Let cool at least 10 minutes before slicing and serving. Recipe formatted with the Cook'n Recipe Card Software from DVO Enterprises.